This week IDW releases it’s newest foray with character Cliff Secord in The Rocketeer: Cargo of Doom, written by Mark Waid with art by Chris Samnee. What’s that? You just did a double take after seeing Waid’s name attached to this? I was right there with you! IDW has done the character a lot of justice with recent collections of the original stories and the two Rocketeer Adventures series, but a solid tale with legitimate length has been the missing piece. 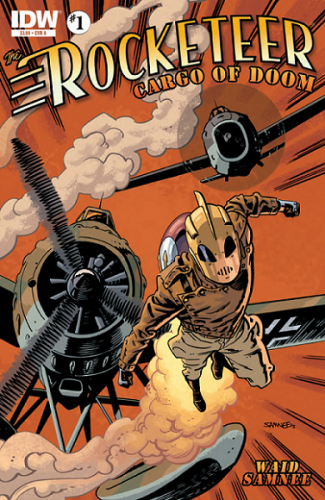 Well, not only are we getting the first full fledged Rocketeer story in years, but one of the most recognizable industry talents of today is writing it! Somebody pinch me! Issue one sets the stage perfectly for what I’m sure will be a fabulous tale. We get a classic opening scene with the Rocketeer involved in a high flying rescue, where we meet Sally, the niece of Cliff’s friend Peevy. To round off the introduction of the usual crew, we see Betty a few pages in with her usual temper tantrum fed by Cliff’s often aloof attention span. To make matters worse, Betty now has Sally vying for Cliff’s time as well. Gotta love the tension! The “fun and fancy free” ambiance of the above scenes contrast heavily with what appears to be Waid’s greatest contribution in the first issue. The mood is dark and the scene is set on a ship headed for Los Angeles. On that ship we meet a quiet and obviously disturbed creature of a man, Guptmann, who claims to have some history with the Rocketeer. That history, apparently, would rather be forgotten as we’re treated to a glorious meltdown once the man touches the shore. Waid takes all readers into account as the book promises to reward long time Rocketeer fans with a fresh adventure, while reeling in newcomers through subtle introductions and relatable conflict amongst the stars of the series. Also apparent is Waid’s intimate knowledge and respect of the material first laid by Rocketeer creator, Dave Stevens. Everyone plays their parts well, and even the new characters Waid has placed fit within the confines of this universe. So, how about the stellar artwork? Samnee’s style is spot on and a great choice based on his soft and realistic forms, an homage of the creator’s own style. I think Mr. Stevens would appreciate that his baby is in such capable hands. The action scenes were all lovely, but I think the stand out is the full page spread of Cliff and Betty having a smooch…it’s a fine way to break the tension and a cap to a fun filled first issue! Plus, it doesn’t hurt that Samnee and Waid have chemistry from working together through Marvel’s ongoing Daredevil series! Overall, this book does everything that’s expected. The creative team delivers a fabulous romp in the Rocketeer way, and only veers off the beaten path slightly with the introduction of a psychologically disturbed aggressor. I think Waid and Samnee do well not to deliver any shockers with the first issue, but I’m hoping they both give Cargo of Doom their own personal flair before series end. Now, go tell your friends, your neighbors, your coworker’s mom’s hairdresser to give this book a shot! Parental concern: A few of the variant covers have some revealing Betty shots. Rocketeer: Cargo of Doom hits stores this Wednesday, August 22nd! You can also find me writing Crowd Funding Flash, out every Wednesday right here at StashMyComics.com! Follow me on Twitter @ChipReece!